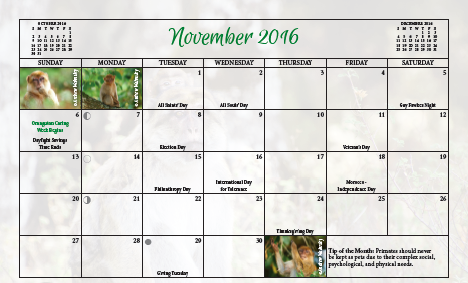 Home > Feature stories > Primate Connections calendars for sale! We are very happy to have been included, once again, in the Primate Connections calendar project, with our photo of a male Barbary macaque with his baby the feature image for November 2016. 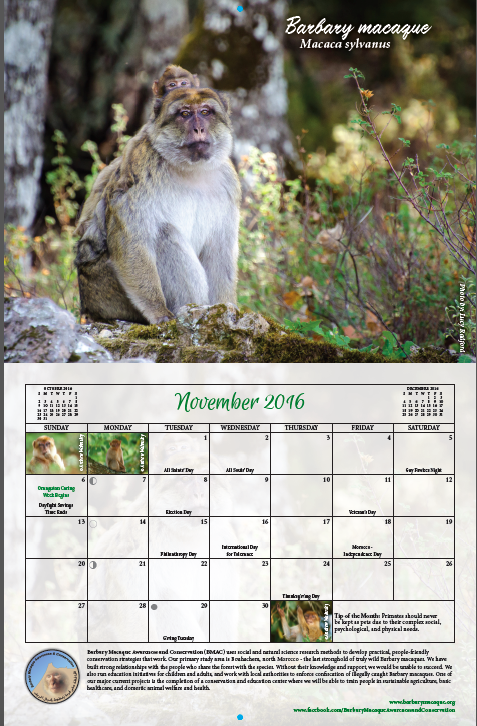 By buying a calendar for yourself, or as Christmas gifts for friends and family, you will make a positive difference to Barbary macaque conservation in Morocco. 40% of the money from each sale comes back to our project, and will be used to continue field work such as surveys, education and Barbary macaque confiscations. Get your calendars here, and don’t forget to send us a photo of yourself proudly displaying your calendar in your home.